Choosing the correct brass stock for your application can save time and make a job easier. Brass is an alloy of Copper and Zinc. As levels of copper and zinc vary from one brass alloy to another so do the the properties of the brass, including its hardness. The Brass Rod listed here is highly machinable and fairly hard. 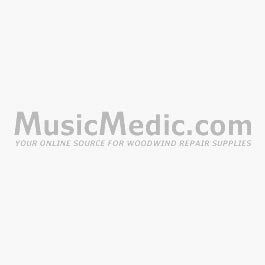 It is excellent for key modifications, making posts, tool inserts, woodwind key extensions as well as most jobs that involve woodwind keys. Sold in 1 foot lengths. Available in bare brass only.